Crawford, Allison. "Suicide among Indigenous Peoples in Canada". The Canadian Encyclopedia, 10 September 2018, Historica Canada. https://www.thecanadianencyclopedia.ca/en/article/suicide-among-indigenous-peoples-in-canada. Accessed 19 April 2019. First Nations in Canada have suicide rates double that of the national average, and Inuit communities tend to have even higher rates. Suicide in these cases has multiple social and individual causes. To date, there are a number of emerging programs in suicide prevention by Indigenous organizations that attempt to integrate Indigenous knowledge with evidence-informed prevention approaches. In the spring of 2016, Attawapiskat First Nation in Ontario declared a state of emergency after 11 young people tried to end their lives by suicide. The news story made national headlines, but this was not the first or only suicide crisis among Indigenous peoples in Canada in recent years. According to The Human Face of Mental Health and Mental Illness in Canada, a 2006 report by the Public Health Agency of Canada, First Nations in Canada have suicide rates double that of the national average, and Inuit communities tend to have even higher rates (six to 11 times the Canadian average). Suicide in these cases has multiple social and individual causes, including social inequity such as poverty and lack of access to healthcare; history of childhood adversity including physical and sexual abuse; historic and ongoing loss of cultural identity; and psychological distress and substance use. Suicide affects not only individuals and Indigenous communities but Canada at large. To date, there are a number of emerging programs in suicide prevention by Indigenous organizations that attempt to integrate Indigenous knowledge with evidence-informed prevention approaches. Suicidal behaviours are intentional thoughts and actions aimed at ending one’s life. They generally include thinking about suicide, inflicting self-harm or attempting suicide, which may result in death (see Suicide). In Canada, approximately 12 people per 100,000 die by suicide each year. Suicide is also a global public health problem; in 2012, for example, approximately 804,000 people in the world died by suicide. For young and Indigenous people, the problem is especially pronounced. Suicide is the second-leading cause of death globally for people aged 15 to 29. Indigenous populations in many areas of the world also have the elevated rates of suicide — including in Australia, New Zealand, Greenland, the United States and Canada. Some First Nations, Inuit and Métis communities in Canada have much higher rates of suicide than the general Canadian population, although it is important to note that some communities have rates that are similar to the national average. Suicide among First Nations youth (aged 15 to 24 years) across Canada is five to six times higher than among non-Indigenous peoples. These elevated rates are seen in males and females, although higher among males. According to a 2000 report by the Canadian Institute of Health, the rate of suicide among First Nation males was 126 per 100,000 (compared to 24 per 100,000 non-Indigenous males), while it was 35 per 100,000 for females (compared to 5 per 100,000 non-Indigenous females). Recent data gathered by Inuit Tapiriit Kanatami for Inuit living in Northern Canada showed elevated rates in all regions, with Nunatsiavut in Labrador experiencing suicide at rates 25 times higher than the rest of Canada (see Labrador Inuit). Rates for Inuit youth in some areas are up to 40 times the national average.. It also appears that many Indigenous peoples in Canada think about suicide more often than non-Indigenous Canadians. Nearly one quarter of First Nations people think about suicide at some point in their life. This also applies to Indigenous people living off-reserve; according to Statistics Canada data from 2012, 21 per cent of First Nations men and 26 per cent of First Nations women living off-reserve have suicidal thoughts, compared with 11 per cent of non-Indigenous men and 14 per cent of non-Indigenous women who had similar thoughts. The 2007–08 Inuit Health Survey also showed that 29 per cent of Inuit have attempted suicide in their lifetime and 48 per cent have thought seriously about suicide. For Métis, thoughts of suicide are higher than non-Indigenous peers, particularly for women. The causes of suicide involve a number of different factors, including social stressors (i.e. stressful life events) and biological, familial, psychological and community factors. (See Figure 1.) Usually, any individual who engages in suicidal behaviour experiences more than one of these factors. Causes of suicide can be separated into protective factors (i.e. conditions or attributes that assist in coping or preventing stresses) including resilience, which can buffer risk for suicide even amidst a great deal of adversity, and distal factors (i.e. predisposing factors), including poverty, genetics or a history of childhood maltreatment. Childhood abuse can cause suicidal behaviours into adulthood, which can be precipitated by certain stressful or tragic events, such as loss. 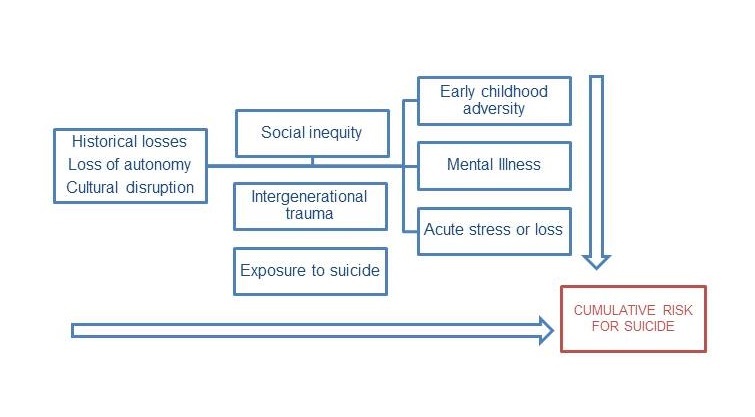 Risk factors at multiple levels create increased risk for suicide at a community level and can set individuals on pathways of cumulative risk that lead to suicidal behaviour. In the general Canadian population, risk for completed suicide is highest among males, aged 50 to 54 years old, particularly those who have depression, are socially isolated and have chronic medical problems. Psychological autopsies gather information on those who have completed suicide in order to understand these risks. These studies show high rates of mental illness, including depression; misuse of substances, such as alcohol, which can increase impulsive behaviour; and multiple recent stressors, such as loss. Recent evidence demonstrates that there may be two groups of people who engage in suicidal behaviour: a group that is younger than 26 years of age at first attempt and tends to have a history of childhood adversity, including physical and emotional abuse and cannabis misuse; and a group that is older than 26 years of age at first attempt, characterized by depressive disorders. Among Indigenous peoples in Canada, risk for suicide is highest in young people, particularly males. Many of the same risk factors for the general population are related to suicidal behaviour among Indigenous youth, such as depression and substance misuse. There is also evidence of the predisposing risk factors that affect other young people with elevated rates of suicide, especially early developmental adversity, such as trauma and abuse, including childhood sexual abuse. This early adversity can create a pathway of cumulative risk, from legal problems and challenges in relationships, to mental health issues and substance misuse. Access to the means of suicide may further increase risk. Many Indigenous youth who attempt suicide do so by hanging. Firearms are also a frequent means of suicide. It is difficult at times, especially in terms of hanging, to limit access to the materials used in suicide attempts. Our central conclusion can be summarized simply:The main policy direction, pursued for more than 150 years, first by colonial then by Canadian governments, has been wrong. 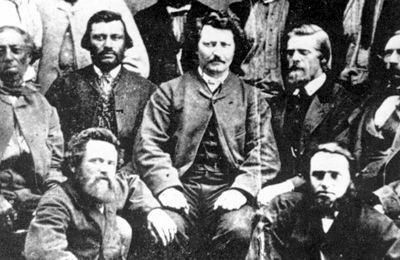 Successive governments have tried — sometimes intentionally, sometimes in ignorance — to absorb Aboriginal people into Canadian society, thus eliminating them as distinct peoples. Policies pursued over the decades have undermined — and almost erased — Aboriginal cultures and identities. Direct consequences of colonial settlement are a decrease in the autonomy of Indigenous peoples and disruption to traditional knowledge, language and ways of life (see Indigenous Languages in Canada). Preserving or regaining autonomy, language and culture can be protective against suicide within some communities. The First Nations Regional Health Survey (FNRHS), for example, showed that there were lower rates of suicidal thoughts and attempts among those who had intermediate or fluent knowledge of their Indigenous language. In families and communities that have been most impacted, on the other hand, cultural loss resulted in historical trauma that may continue across generations, affecting even younger generations that did not experience these disruptions within their lifetime. 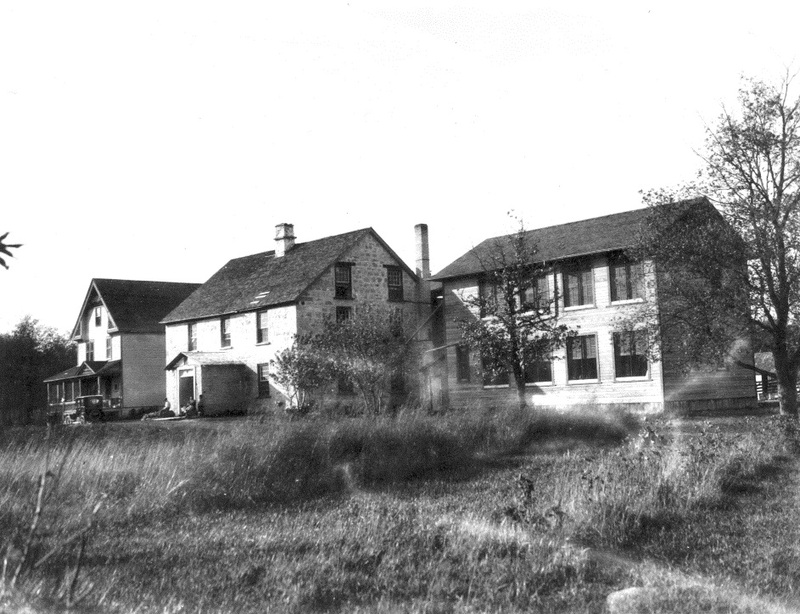 Research with the children and grandchildren of residential school survivors, for example, reveals that these generations have a higher incidence of psychological distress and suicidal behaviours compared with their peers whose parents or grandparents did not attend residential school. Traumatic losses of loved ones and exposure to suicide among community members and peers adds to community and family grief, and contributes further risk for suicide among youth. Many of these historical disruptions and abuses have resulted in ongoing social distress, which is compounded by wider socio-economic and health inequities (see Indigenous Peoples: Economic Conditions; Social Conditions of Indigenous Peoples). Social factors, such as income and education, are known to influence the overall health and wellness of people, including their risks for suicide. Indigenous peoples across Canada experience lower educational achievement and income, higher unemployment, food scarcity, poor access to housing and more barriers to accessing health care compared with the general population. These inequities can contribute to higher rates of many medical conditions, such as diabetes and infectious diseases, which, in turn, influence mental wellness. FNRHS found higher rates of depression, suicidal thoughts and suicide attempts among those who also have a chronic medical illness. It also found that individuals who reported higher levels of stressors, such as low socio-economic status, and being subject to instances of aggression and racism, reported being moderately or highly distressed more often than those who did not. Addressing the risks for suicide that exist at these multiple levels and that impact both individuals and the community as a whole, requires multi-level approaches that reduce risk and also build in protection and resilience. Suicide prevention and mental wellness require investments beyond mental health care. Given the historical losses that resulted in loss of autonomy for many Indigenous communities, it is of key importance that efforts to address suicide are led by Indigenous peoples and target the community as well as the individual. Prevention and intervention should draw on the values, knowledge, strength and resilience of Indigenous peoples. There is a growing wave of Indigenous youth who prefer to talk of life promotion, focused on building strength and meaning among youth instead of what they perceive as a deficits-based approach to suicide prevention. There are also, however, many emerging programs in suicide prevention by Indigenous organizations that continue to draw on global best-practices in suicide prevention, while integrating those with their own practices and settings, making them more resonant with Indigenous world views. Examples of this include programs led by elders or knowledge keepers, programs that incorporate ceremony and cultural teachings, are led in Indigenous languages, or that occur on the land. Regardless of the approach, most practitioners in this field acknowledge the need to evaluate the effectiveness of interventions to add to Indigenous knowledge in this area and to ensure that the most effective solutions are found. 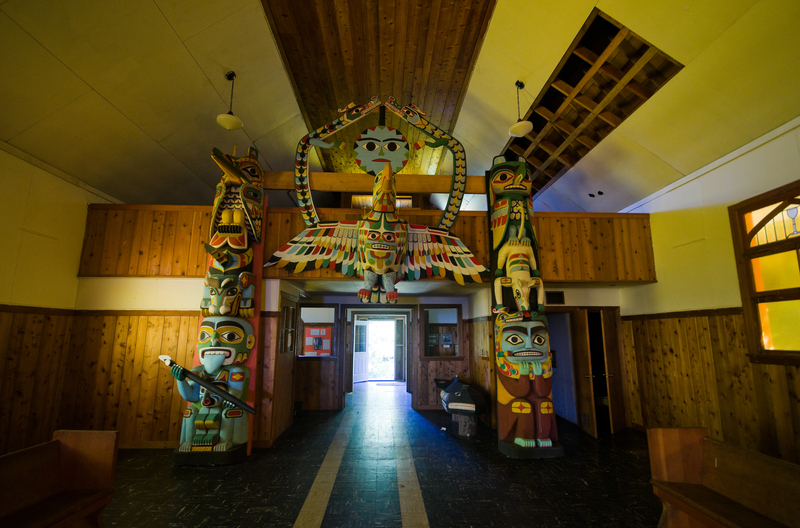 One of the most promising areas in suicide prevention by Indigenous groups, both globally and within Canada, is the development of suicide prevention strategies. One of the first national Canadian approaches is the National Inuit Suicide Prevention Strategy developed by Inuit Tapiriit Kanatami. There is evidence that suicide prevention strategies themselves reduce suicide through advocacy, focusing resources towards priority areas, integrating services and creating accountability. Indigenous-led strategies can ensure that the focus is specific to the needs and values of the Indigenous group. These strategies can also ensure that a holistic approach is taken, understanding the need to reduce risk and build resilience throughout an individual’s life, while also addressing the wider social context, building equity for all and restoring community autonomy and cohesion. Laurence J. Kirmayer and ‎Gail Guthrie Valaskakis (eds) Healing Traditions: The Mental Health of Aboriginal Peoples in Canada (2009). Stephen H. Koslow, ‎Pedro Ruiz and ‎Charles B. Nemeroff (eds), A Concise Guide to Understanding Suicide: Epidemiology, Pathophysiology and Prevention (2014).